I've barely recovered from my birthday at the end of October and before we know it, it is time for Thanksgiving. Then, the turkey-induced coma has barely worn off and it is time for Christmas. Yes, there is great joy and cherished time with family and loved ones but there is also very often, quiet, sometimes lonely reflection that is wrapped up in these holidays. Let's start with the most personal of holidays: birthdays. The day we are to celebrate our coming into the world. Depending on your traditions and maybe your age, commemorating the day you were born can be varied but for the majority of Americans, this is the day that you are expected to celebrate. For me and many of my adopted friends, this is a complicated day, right up there with Mother's Day and Father's Day. While it is certainly a day to celebrate my life and being on the planet, it is also a day that is filled with palpable questions, confusion and emotion. Even as I feel the joy of being alive and the deep love of my family and friends, I can't help but think about my birth mother and wonder when she was alive, did she think of me on my birthday? Did she feel a similar ache on that day? And while I did not ever meet her again as an adult, did we at least share in that? My late October birthday that falls just shy of Halloween gives way to November and one of the most family-centric holidays of all: Thanksgiving. At the center of the table is the turkey dinner but the connections and conversations around the table are what sustain us. Inevitably, the moments of relative comparison come -- gosh Mackenzie, Kyle and Cooper look so much like Dawn and Dawn looks so much like Grandma and Grandma looks so much like Great Grandma Ellie. These very basic, often unconscious moments are standard fare for biological families. For the extended family of adoption, specifically for some adopted people who were separated from their biological families and don't look like anyone around the table, these moments can be subtle and at the same time otherworldly. Ironically, as the one that looks least like my family, I often find myself making these comparisons and remarking at how powerful genetics are. Born to a family of origin, raised by a family of experience, the adopted person balances two worlds -- part of a family's history, but not necessarily its origins, and part of its present and future but not its past. Thanksgiving is barely over and bam! -- it is time for Christmas. For many, these are the days of hustle, bustle and preparing to spend more time with those we love. As we approach Christmas Day -- December 25th, regardless of religious affiliation or belief, out come the images of a baby. It is hard not to see these images of the miracle baby, swaddled and small, over and over again throughout the season. 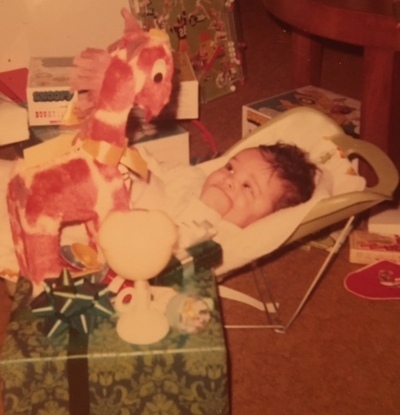 I have always loved Christmas and I have always found myself staring with wonder directly into the eyes of the small baby when I see him. It conjures up thoughts of my first Christmas Eve in the world. Not yet, adopted and still in foster care, this baby's first Christmas was spent with yet a different family. A family that seemed to take wonderful care of me, one that sent along instructions and photos when I went to my pre-adoptive home with the Dinwoodies, one that described my leaving them was a great sadness, and one that legally I am not allowed to know or be in contact with under the closed adoption system. While challenging, I still see the beauty of these gifts and the necessity of unwrapping and understanding them. My life is a gift. My adoption journey is a gift. The exploration of my identity is a gift. My families are a gift -- all of them -- the one I was born to and separated from, the one that took temporary care of me in foster care, the one that I create around me with friends and most importantly, the one that I know best and that knows me best, the Dinwoodie family. As we close out another holiday season, when time with loved ones is precious and plenty, it is a perfect time to take stock of my treasured gifts. Not the material ones, the countless ones I have received as part of my journey to uncovering more about my beginnings and myself. I can't help but be grateful for the gift of my family and being a Dinwoodie. I can't help but acknowledge that their fierce love and dedication to me is a key ingredient to being able to search and make necessary and precious birth family connections. As I make them, I can't help but be heartbroken that my birth mother could not open up to me and that I still don't know who my birth father is. Even while I had everything and more from my adoptive family, I acknowledge the loss of the family I was separated from. I can't help but marvel at how adoption has shaped my identity and my families and continues to inspire me to be a gift in as many ways as possible to as many people possible. Tune in to April's December podcast on iTunes to hear more about her personal adoption journey.